President Trump on Monday blamed a sharp stock market downturn on the specter of Democratic investigations when they take control in the new Congress. “The prospect of Presidential Harassment by the Dems is causing the Stock Market big headaches!” Trump said Monday in a tweet published two hours after U.S. stocks opened with heavy losses. The Dow Jones Industrial Average had lost more than 400 points by 11:20 a.m., a 1.6-percent drop, while the Nasdaq composite sunk almost 3 percent. The S&P 500 fell 1.5 percent. A 4.5-percent drop in Apple’s stock prices led to steep declines across the tech sector as one of Wall Street’s best-performing industries continued to take heavy losses throughout the year. U.S. stocks have dropped steadily since the start of October as traders fear an imminent economic slowdown, fading global growth and rising trade tensions. Analysts have said that the strong U.S. economy appears to be past its peak, while corporations report narrower profit margins. Even so, Trump has repeatedly blamed the downturn on the prospect of a Democratic majority in the House blocking his legislative agenda and probing his personal finances. 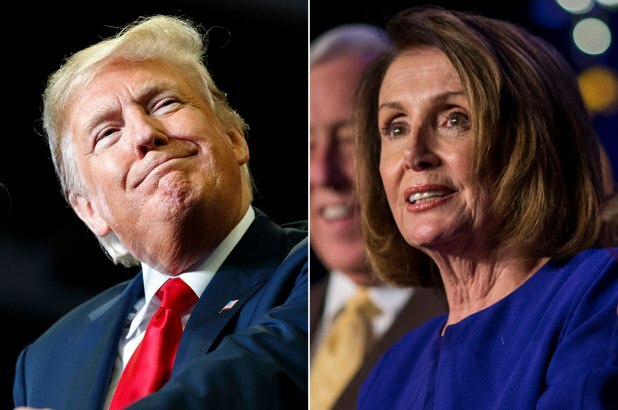 Democrats in line to chair key House committees have pledged to obtain Trump's tax returns and banking records, seeking evidence of illegal activity. The president has also blamed Federal Reserve rate hikes for the stock market slide, blasting the central bank for pulling back economic stimulus. Most Republicans and a slew of Democrats support the Fed's efforts to normalize monetary policy while unemployment remains at record lows amid strong U.S. growth. Analysts say the stock market downturn has little to do with a Democratic House takeover and is more reflective of a broader correction after years of consistent gains.